This is a review of the product Fusskraft Blue which is manufactured by Gehwol, a German foot care company. It claims to help you achieve healthy feet by preventing common odors and fungal infections as well as relieving dry and rough skin. Read on to learn if Fusskraft Blue is right for you. Lanolin is a waxy substance that is often used to moisturise skin. It is ideal for treating skin that is rough, dry, scaly or itchy skin. Urea is a substance which is often used to treat dry or thick skin by reducing both scaliness and itching. Rosemary oil is suggested to be able to relieve the symptoms of indigestion, stress, and pain while simultaneously boosting your immune system. Mountain Pine oil is a traditional German remedy for soothing sore muscles and relieving pain. It is said to have anti-inflammatory properties as well as stimulate blood circulation. The instructions for this product are not listed by the manufacturer. Gehwol recommends that you soak your feet in a warm bath before you apply their product. If you have any allergies to any of the mentioned oils or products, you should consult your doctor before using this product. Many of the emollients listed on this ingredient list are used safely with no side effects. However, if you do find that there is serious burning, redness, or irritation in the area in which you applied the product, you should discontinue use and contact your pharmacist or doctor. While these products are safe for topical use, several of the ingredients including rosemary oil are toxic if they are ingested. If you accidentally ingest this product, contact your doctor immediately. The Amazon price for this product is listed at $8.75 without shipping and handling costs. This price is marked down from $27.42. Because instructions are not included online, it is difficult to tell how many doses are contained in each tube. Gehwol Foot Care does not accept returns unless they have shipped you the wrong item. They also offer no guarantee as to the efficacy of their products. The customer reviews on Amazon are generally positive with the main complaint being that the ingredients and instructions for the product are not disclosed online. Most customers who use this product seem to suffer more from dry or itchy feet rather than athlete’s foot. 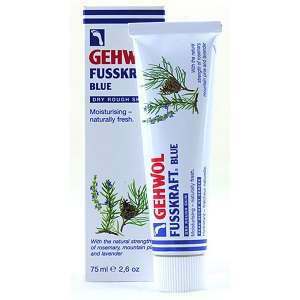 Gehwol’s Fusskraft Blue claims to help relieve dry and itchy feet as well as prevent common diseases like athlete’s foot. It uses mostly natural products and essential oils that work to moisturise and soften the feet. However, they do not include much information about their product online. They do not include the directions or dosage necessary and so it is difficult to tell how much of the product you will need to help relieve your feet long term. While many customers on Amazon provide positive reviews, they do not seem to be suffering from the odor or pain caused by a fungal infection. The product is more expensive than other products on the market and the company offers no guarantees which makes this investment riskier than other similar products. Jimmy Rodriguez	reviewed Gehwol Fusskraft Blue	on June 7th	 and gave it a rating of 2.5.